Site Name: No. 59 PENDRE; MEDICAL HALL; BERLIN HOUSE; GLASGOW HOUSE. In 1848 Glasgow House was occupied by S. J. Evans, timber merchant, and his unmarried sisters the Misses Margaret & Bessie Evans. In 1851-76 Margaret Evans kept a grocer’s shop here. In 1851 the building was occupied by Margaret Evans, 54, grocer & tea dealer; and Eleanor Llewelyn, 29, general servant. On 10th February 1858 James Ayling, possibly of this address, was buried at St. Mary’s Church having died aged 59. In 1861 Margaret Evans, 62, grocer, lived here. Also living here at that time were Margaret Ayling, 63, merchant’s widow; her daughter, Marion Ayling, 22, girl’s schoolmistress; Anna Maria Griffiths, 32, daughter; Thomas Griffiths, 26, son-in-law; and Thomas Griffiths, 7 months, grandson. The school of the Misses Ayling on Pendre was referred to in 1861-68. In 1871 No. 59 was occupied by John T. Mathias, 47, watch-maker; and Margaret Jenkins, 29, servant; and No. 60 was occupied by Margaret Evans, 73, grocer; and Ann Jenkins, 49, servant. On 21st January 1876 Margaret Evans was buried at St. Mary’s Church having died aged 83. In 1881 the following persons lived here: No. 59: John Turnor Mathias, 58; John Mathias, 25, his son; Margaret Jenkins, 38, housekeeper; and Margaret Williams, 16, general servant. No. 60: Thomas Harris Jones, 29, grocer; Hannah Jones, 26, his wife; and Sarah Davies, 51, aunt. In 1884 Mrs. Hannah Thomas kept a grocer’s shop here. 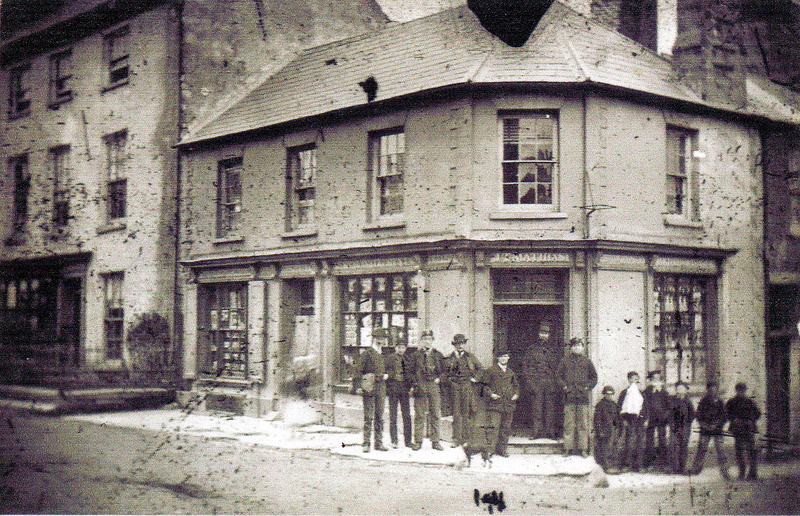 On 4th September 1884 John Turnor Mathias’ shop here was sold by the Priory estate. On 4th October 1884 the corner shop, occupied by J. T. Mathias and formerly part of the Priory estate, was sold to Rev. William Jones of No. 6 Castle Street, Cardigan, for £730. In March 1888 David Griffith Jones, draper, son of Rev. William Jones, married Jane Olive Maddigan. On 17th November 1888 Margaret Ayling, possibly still of this address, was buried at St. Mary’s Church having died aged 90. In 1889 William E. Jones was probably born here. 1891-1903 David Griffith Jones kept a draper’s shop here. On 21st June 1893 Idris Jones, son of Mr. & Mrs. D. G. Jones, was born here. On 30th July 1895 Olive Jones was born here, the daughter of draper David Griffith Jones. In 1901 the following persons lived here: David Griffith Jones, 41, draper & shopkeeper (b. Cardigan, bilingual); Ina Jones, 39, his wife (b. Somerset, English-speaking); Willie E. Jones, 12, their son (b. Cardigan, bilingual); Idris Jones, 7, son (b. Cardigan, bilingual); Olive Jones, 5, daughter (b. Cardigan, bilingual); Annie Parsons, 35, sister-in-law (b. Cardiff, English-speaking); and Mary Jones, 17, domestic servant (b. Blaenffos, bilingual). On 24th January 1908 tenders were sought for alterations to Glasgow House for Howell Morgan, chemist, to designs by Lewis Lewis, architect. Howell Morgan moved here on 3rd April 1908, and the building became known as “Medical Hall”. Howell Morgan traded here in 1908-28. In 1911 the following persons lived here: Howell Morgan, 36, chemist; and Sarah James, 41, servant. On 2nd November 1912 Mrs Howell Morgan gave birth to a stillborn son. In January 1915 tenders were sought for rebuilding Medical Hall for Howell Morgan to designs by John Teifion James Williams. The old building was demolished that July. No. 59 was rebuilt and dated for him in 1916 to designs by J. T. J. Williams. It was about to open on 3rd March 1916. In 1916-28 the occupiers and chemist’s shop proprietors were Mr. & Mrs. Howell Morgan. On 27th June 1917 a son was born to Mr. & Mrs. Howell Morgan. On 13th December 1928 Howell Morgan, chemist, died aged 54 under tragic circumstances. In 1929-60 Mrs. Margaret Anne Morgan, widow of Howell Morgan, and Geraint Howell Morgan lived here, trading as ‘Howell Morgan’. Elsie Mary Lloyd, Lyndon Lloyd and Mariah Ann Williams lived here in 1938. In January 1939 Geraint Howell Morgan passed his pharmaceutical examination. In February 1940 Geraint Howell Morgan was a sergeant in the army. On 31st December 1960 Mrs. Margaret Ann Morgan, widow of chemist Howell Morgan, died aged 78. Geraint Howell Morgan traded here in 1960-76. Permission was granted in 1989 for the use of the upper floors as flats. 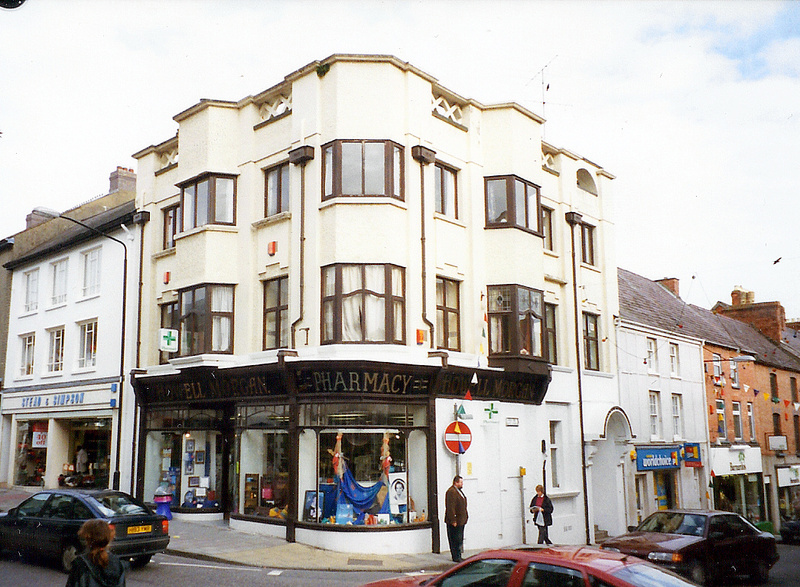 D. M. Wakelam was the pharmacist here in 1995-96. By 1998 the upper storeys were used as rented flats. By January 2001 Roger Taylor was the pharmacist. In early 2007 the property was renovated and the ‘Howell Morgan’ sign removed. 1916 chemist’s shop and accommodation built for Howell Morgan to designs by J T Williams. Unusual corner building in painted roughcast with leaded flat roof concealed by parapet wall with projecting coping. West façade to Pendre has 3 storeys, 3 windows. Openings have timber framed lights, bisected to second floor, 4-pane to first floor Centre bay is canted full-height projection with windows to façade and narrower lights to canted angles. Plain aprons and walling continues to parapet. Between bays, parapet interrupted by pierced lattice in cement render above stone sills to coping height. Frontage to Priory Street has 4 window range with matching fenestration and projecting full height bay to 2nd bay from left, retaining leaded and coloured glass to first floor. Ground floor is original shopfront with curved glazing with narrow traceried glazing over. Central door to Pendre, half glazed and decorative. Narrow timber pilasters between panes. Curved glazing to angle. Blank wall to Priory Street pierced by small window set to right. Far right is half-glazed door with projecting stucco arched hood on brackets. Above shop windows and blank walling is continuous angled shop sign of 1916. Rainwater goods in cast iron dated 1916. INTERIOR (2001) – Significantly altered as shop with flats above. Four-sided well stair survives with decorative ramped handrail, stick balusters with carved details and cornice and pendants. Tall decorative posts to angles with wide tapering pointed 4-sided heads and recessed panels beneath. Old photographs show earlier building here of c.1860 in stucco with hipped slate roof and canted SW angle. Two-storey, 3-bay range to Pendre with 12-pane sashes to first floor. Ground floor had continuous projecting corniced fascia with sign, and pilasters, continued around canted angle with small plate glass window. Priory Street side had similar first floor light and fascia sign with plate glass sashe below and raised plinth. Brick wall stack.